◆We open an advanced apparatus of Miyagi industrial technical general center and Tohoku University to the local company and aim at the development of whole region. 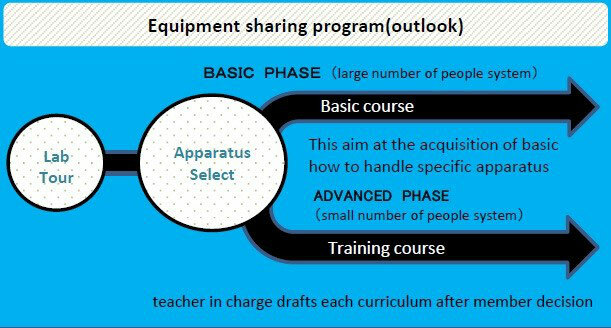 This equipment sharing program consists of Basic Phase giving lessons in how to use 1-2 specific apparatuses for a beginner, and Advanced Phase for the member attending a lecture with the use experience that this uses the target apparatus in a participation in planning laboratory. Because these two Phases are beginning the lecture in parallel, only in Basic Phase, the attendance only for Advanced Phase is possible, and the attendance is possible at the same time. We guide about one month ago of the opening of a school day on the HP. The curriculum is decided in consideration of the experience of the user after the interview with the charge instructor of each laboratory after choice with the apparatus from a list of apparatuses (in preparation). * About application for 2013, it switched to accepting an application at any time.